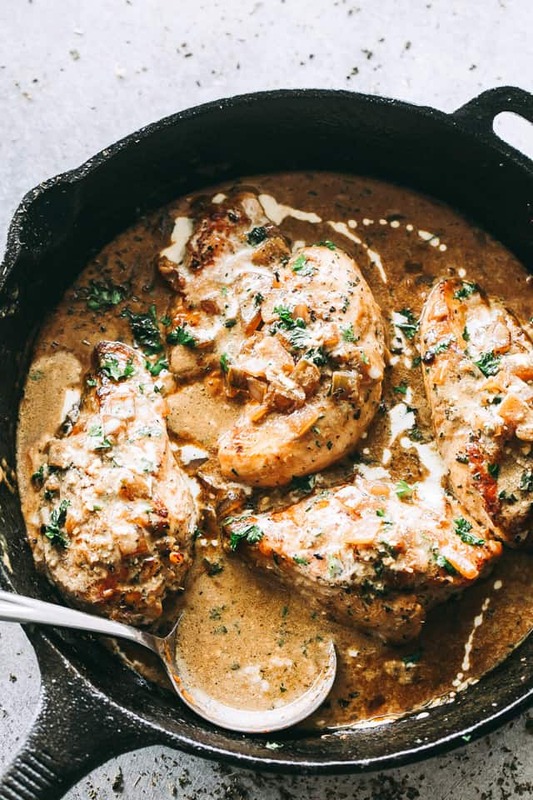 Quick and easy skillet seared chicken topped with a creamy garlic and onions white wine sauce that’s sure to please any crowd! Heat olive oil in a large skillet over medium heat until the oil shimmers, about 2 to 3 minutes. Add chicken to the skillet and cook until golden brown, about 6 minutes. DO NOT move it around. Using tongs, flip the chicken over and continue to cook for 6 more minutes, or until cooked through. Remove chicken from skillet to a plate; cover and set aside. DO NOT wipe the skillet. Add butter to skillet and melt over medium-high heat. Add onions and cook for 3 minutes, or until softened. Stir in garlic, salt, and pepper; cook for 30 seconds, or until fragrant. Add wine and bring to a simmer, scraping the bottom of the skillet to mix the brown bits into the liquid; cook for 4 to 5 more minutes, or until half of the wine has reduced. Stir in thyme and half-and-half. Reduce heat to slowly bring to a boil; place chicken breasts back in the skillet and leave to simmer and thicken for about 4 minutes.